They come in lots of different fabrics and patterns. When you choose sun control fabrics for your motorized blinds, you’re being kind to the planet by reducing energy consumption and you’re being kind to your pocketbook by lowering your energy costs. 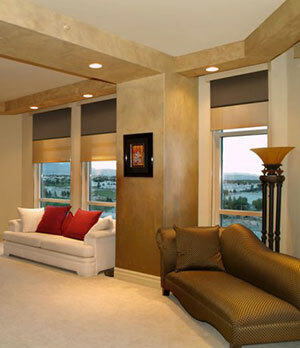 If you can’t decide whether you want darker-colored fabrics for your motorized blinds or lighter-colored ones, you’ll be delighted to discover there are benefits to both. When you opt for energy-efficient, lighter-colored fabrics for your motorized blinds, they’re able to reflect the sun’s rays and reduce the amount of heat absorption; however, if you are looking for absolutely no glare or reflection in the room, you’ll want to opt for darker fabrics for your motorized blinds. Our consultants can help you choose the right ones for your needs. They offer the best of both worlds: the sunlight without the glare. If you don’t want to order all dark fabrics for your motorized blinds, and aren’t sure if you want them to be in lighter-colored fabrics, another option includes various performance fabrics. These alternatives provide a lighter color or an aluminum coating to face outward not only to diffuse the light entering the room, but also to eliminate any semblance of glare often present with lighter-colored fabrics. The unique aluminum coating is energy efficient - even more so than the traditional sun control fabrics. In addition, darker fabrics for your motorized blinds enable you to retain your exceptional view to the world outside your windows, while still absorbing all the excess light and potentially-uncomfortable heat building up in your space. They protect your privacy and possessions. While it’s nice to have a room with a view, sometimes you just want total privacy. Dressing your windows with beautiful blinds gives you the freedom to still enjoy how your windows look even if you don’t want to see beyond them and don’t want anyone else to see in your room. Further, by investing in blinds that filter and diffuse the sun’s UV rays, you’re creating a comfortable and welcoming naturally-lit space without having to worry about your heirloom furniture, custom flooring, or paintings fading over time. It doesn’t matter how aesthetically-appealing, expensive, high-tech, or trend-setting something is in your home if you have to worry about the safety of others around it. Motorized blinds are cord-free, leaving no potentially-dangerous cords to dangle and tempt curious kids who want to play with or around the cords found on other types of window coverings. Forget about getting up from your comfortable position to open or close the blinds. No need to ever wonder or worry again if you remembered to open the blinds in your front room for Fido to enjoy the view while you’re at work. Motorized window coverings are so easy to set, use, and operate you’ll want them throughout every room in your home. When you opt for wire-free motors, their AA lithium batteries will not only save on installation costs, but also eliminate any need to have an outlet nearby. Your window coverings set the ambiance for the room. Today, window treatments and coverings do more than provide privacy and block out the outside world; they’re an integral component of your room’s design and your home’s overall look.